Galapagos cruise versus hotel: Which Should I Choose? Galapagos Cruise versus Galapagos Hotel: Which Should I Choose? The Galapagos Islands will prove to be a fascinating experience for all kinds of travelers. 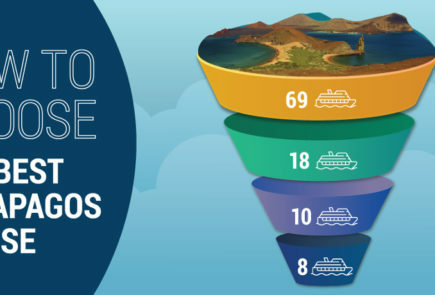 However, one question you should ask yourself before your journey is: should I stay at a hotel or in a Galapagos Cruise? It’s important to recognize that both options allow you to experience the Galapagos Islands at their most beautiful – they just provide you with different ways to go about it. So – how exactly can you know which option is best for you and your family? There’s a long list of things you should consider prior to making your decision. For instance: does anyone in your family get seasick easily? Are water-sports something you enjoying actively participating in? How luxurious do you want your accommodations to be? Answering these questions will help start you off. It’s also important that you sit down with your family and discuss what things you want to do, see, and experience during your trip: do you want your trip to be as relaxing as possible? Maybe your family has a penchant for adventure and discovery? Or maybe you want to see as many animals as possible? At Metropolitan Touring, we’re committed to helping you design the perfect trip for yourself and your family. Below, we’ve listed some of the unique benefits that come from visiting the Galapagos in an expedition vessel AND staying at a premium hotel. We hope that, by using the answers to the questions above and the information provided, you’ll be able to make the best decision! Traveling the Galapagos Islands by cruise yacht is one of the most popular tour options for a reason. A Galapagos cruise will allow you to explore several islands and discover an ample range of sights; whether you’re snorkeling at Champion Islet, or hiking through vast volcanic landscapes, a Galapagos cruise will most likely have you covered. You will also benefit from having excellent amenities and opportunities within the expedition yacht community. All of Metropolitan Touring’s yachts offer exquisite culinary options, an ample variety of water and land activities (kayaking, snorkeling, glass-bottom boats, trekking, you name it! ), and enough space on deck to relax after a long day. A cruise vacation is ideal for active families that have a penchant for exploration. Our cruises make port in several islands, each unique in its own way. During an Galapagos cruise vacation, you’ll find that you will spend most of the day off-board and participating in several activities. If you’re looking for an exciting vacation full of adventure, this is the best option for you! Another great way of discovering the Galapagos Islands is by staying in Finch Bay, one of our premium hotels. This is an ideal option for families who are looking for a more relaxed experience. Finch Bay offers plenty of activities – you’ll be able to explore nearby islands in an exclusive yacht, relax by the pool or one of the many gorgeous beaches nearby, and be delighted by the world-class gastronomy on offer. In fact, Finch Bay is the only beachfront hotel in the Galapagos Islands. The Finch Bay pool area combines luxury and nature into a breathtaking view. At a Galapagos hotel, you will have the liberty to relax or discover on your own schedule. This is ideal for families whose members have distinctly different interests; for instance, you could go scuba diving while your daughter might decide to spend the day lounging by the pool. Finch Bay is conveniently located in Santa Cruz, which is close enough to several of the most fascinating islands in the archipelago; this means you’ll be able to explore every day to your heart’s content and return to the comfort of your luxurious suite every night. 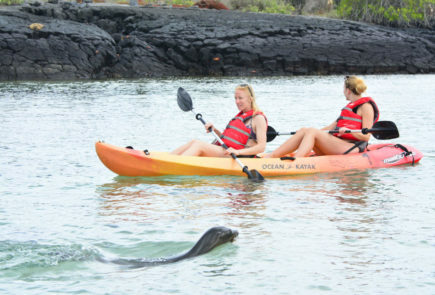 This option is ideal for families who are looking to have more control over their activities in the Galapagos. Finch Bay’s offer allows families to tailor their trip to match their own common and individual interests: you will be able to visit nearby islands on the hotel’s small yacht or simply relax by the gorgeous coastal sights. Kids will also be offered ample entertainment opportunities during their stay at Finch Bay: pizza nights, board games, movies, and kid-friendly meals can be organized for interested families. No matter which option you choose, we’re sure your stay at the Galapagos will be an unforgettable one! If you’d like to learn more about our different cruise options, CLICK HERE. If you’re interested in Finch Bay Hotel, CLICK HERE.